After the yard, the next thing we focused on was our bed. We’ve always dreamed of having a bed big enough for us to each spread out in without touching each other. Romantic, I know, but I’m sorry… our bodies radiate heat. I surfed the internet and pinned bed frames I liked but kept coming back to the same Pottery Barn King Bed. Being the cheapos we are, we didn’t exactly want to pay for the oh-so-trendy $1,600 name-brand bed I had my eye on. 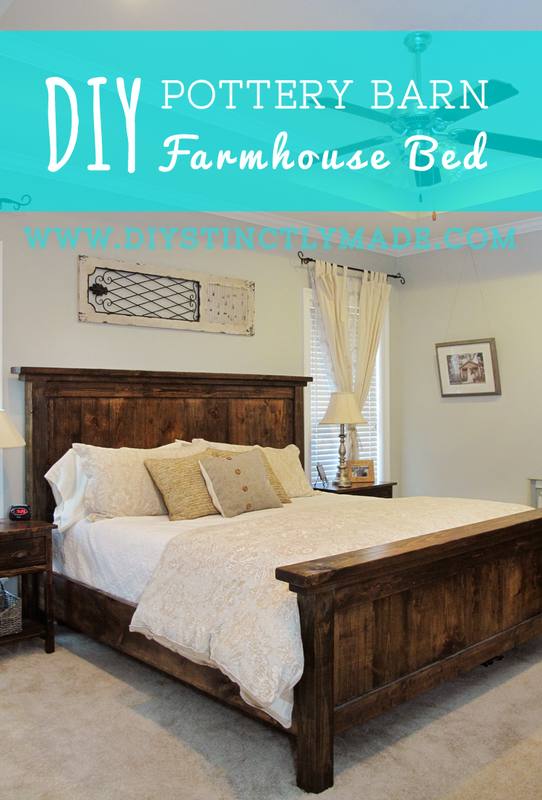 I started searching DIY projects on Pinterest and came across a DIY Pottery Barn Farmhouse Bed – PERFECT! Turns out there are pdf instructions for all sorts of furniture at Ana-White.com. This website is awesome! *UPDATE: I’ve gotten a lot of requests for links to the plans since they have become a little harder to find… here ya go! I downloaded the pdf and sent it to Kurt hoping/praying he would be up for the challenge. Surprisingly, he was! We decided to add 3 inches to the height of the head board panels and 5 inches to the height of the foot board panels because I wanted our bedding to fall just below the foot board, not the other way around. We had a saw, a drill, and some wood glue…that’s it. 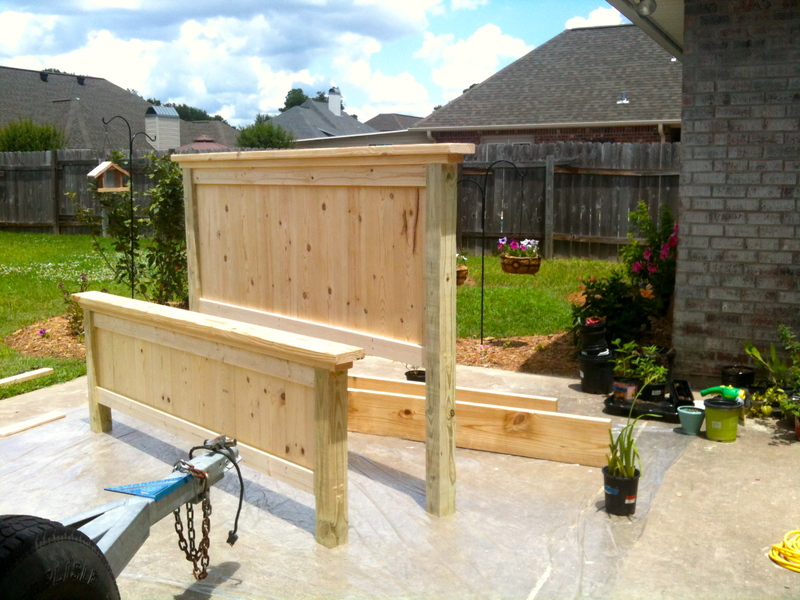 No saw horses, no clamps, no nail gun or compressor. We’re not experts, we’re cheap, remember? 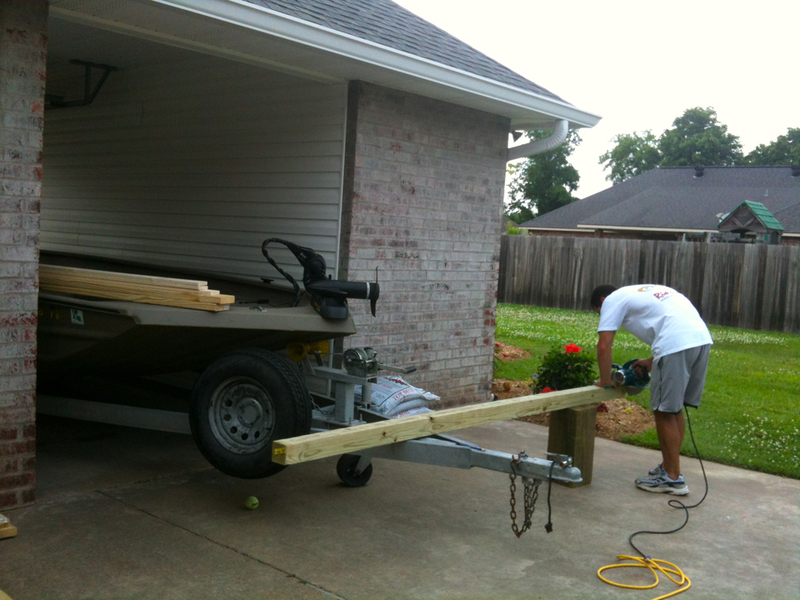 We made do using our boat trailer as a sawhorse… DIYstinctly Creative! It was an interesting process and we definitely learned how well we work together. 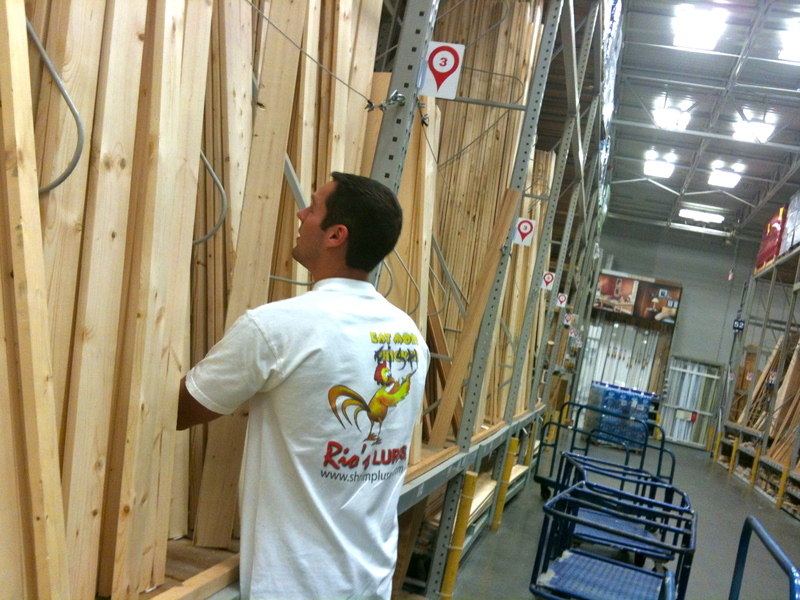 I was gluing and squeezing pieces together as Kurt screwed and nailed the boards together. We lined up the vertical pieces of wood that would make up the head board and foot board keeping the location of knots in mind. Next we sandwiched the vertical pieces in between the horizontal pieces and started attaching them together. 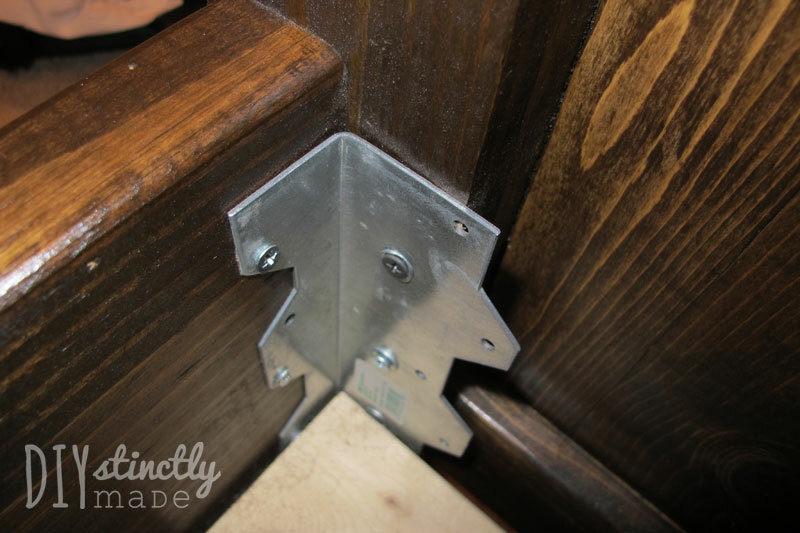 We used screws on the back of the bed and finishing nails on the front – we figured the screws would help pull and hold everything together better. 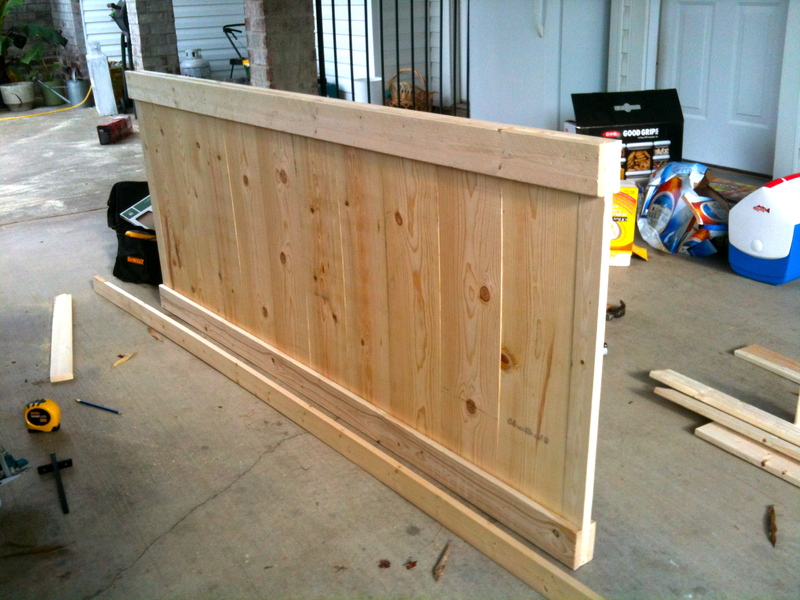 Next we attached the posts to the sides of the head board and foot board. Our bed was starting to come together! The other boards you see are the baseboards. We have to have baseboards on our bed because our dog is psychotic and attacks dust ruffles. 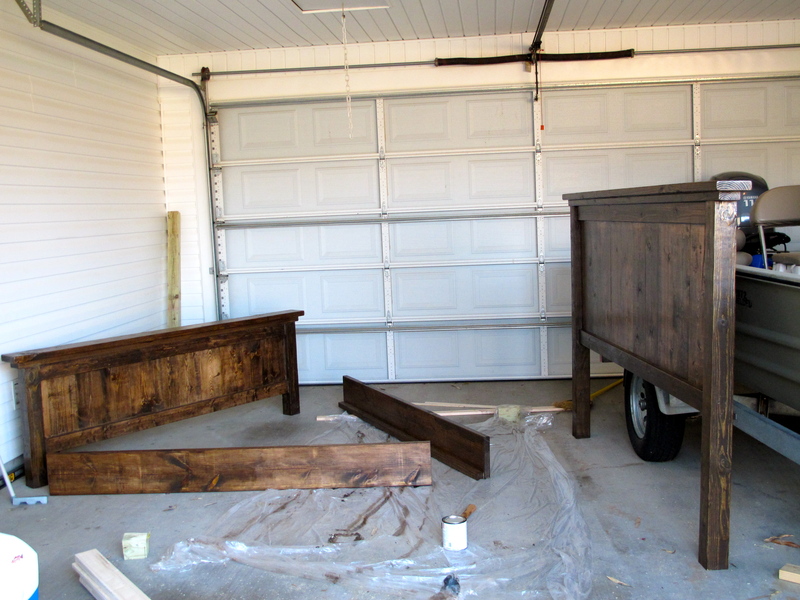 We used Rustoleum Dark Walnut stain and Minwax Helmsman Satin Spar Varnish to finish. 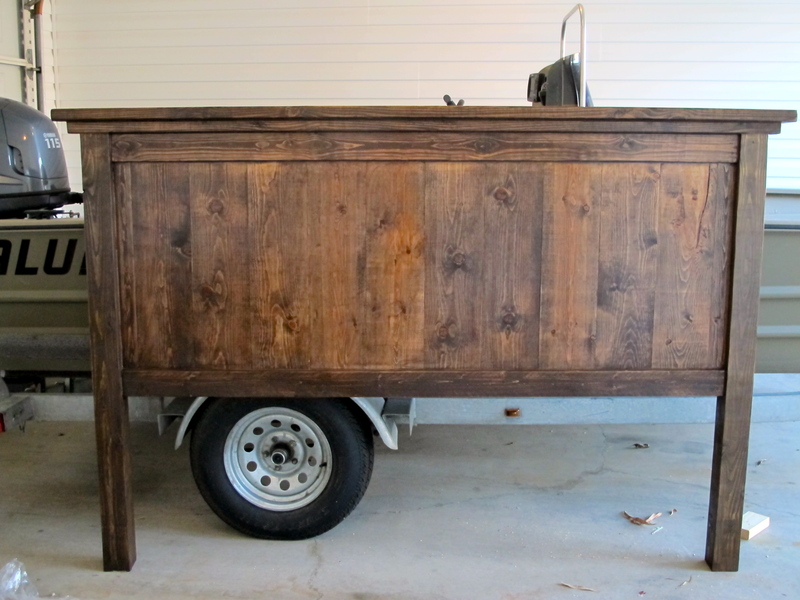 It’s recommended that you use the same brand stain and top coat but the Minwax Dark Walnut stain was too dark so we decided to go with Rustoleum brand stain and use the Minwax topcoat we already had on hand. 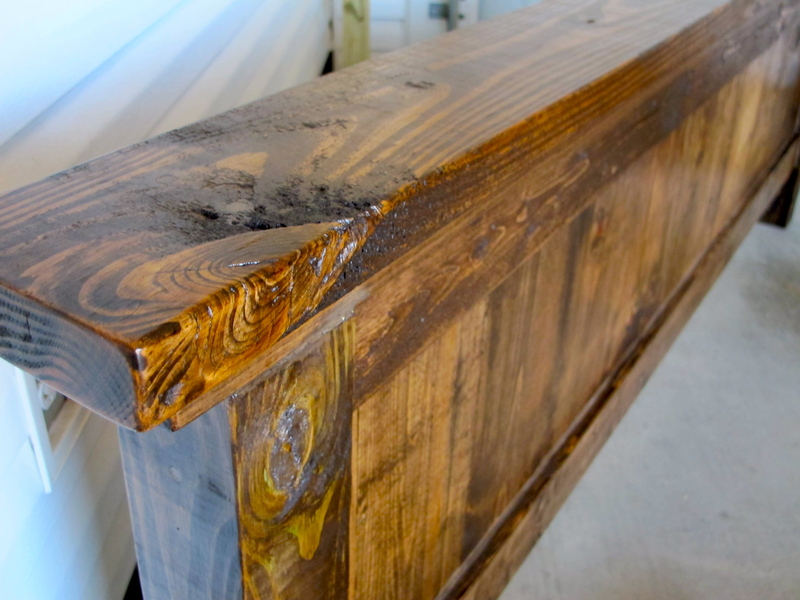 We applied the stain with a brush and after seeing how dark it was, we immediately wiped it off with a clean cloth so that the wood grain would show through. If you apply the stain and give it time to soak in, it will appear dark than what you see in our photos. We attached the base boards to the posts using metal brackets. Kurt also created a center support for the slats below the mattress by screwing the leftover pieces from the posts to a 2×4 that extended the length of the bed. Our bed came out even more amazing and has given us confidence to do more DIY projects. If we were to buy this bed from Pottery Barn it would have cost over $1,600. This bed cost us around $250 to build ourselves. The end result is amazing and we love our new DIYstinctly Made bed. The best part is we can say we did it together! Awesome job doing this next month I have a question seen you have responded a lot to this I get you added those inches to the panels what about the posts? And base boards? I’m think about using 2×12s . YES – we did add the inches to the posts so that the gap below the baseboards would remain the same height as originally intended. I am not home to measure, but we used either 2x10s or 2x12s for the baseboards – honestly, I knew the height I wanted when I saw the wood in the store. 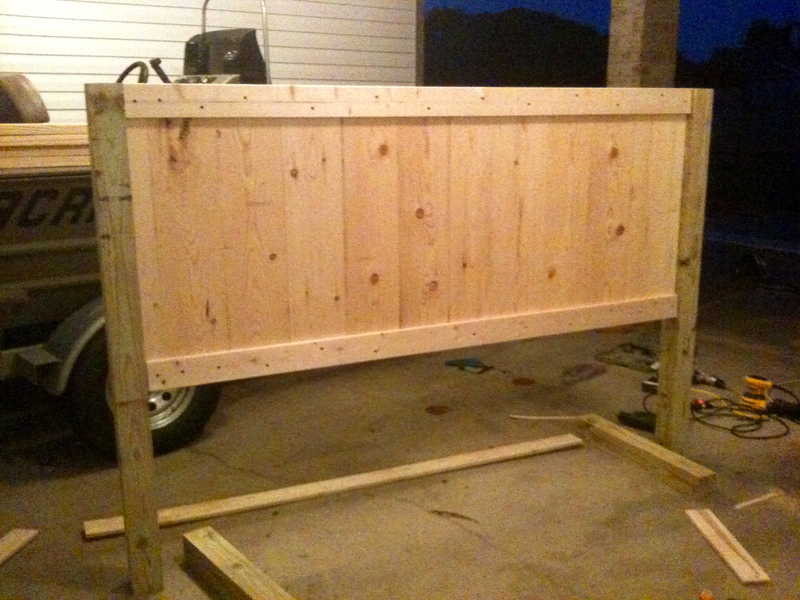 I am in the process of making this and we currently have a metal frame that our box springs sit on. Do you think that it will fit inside the frame if we do not add the 2×2 pieces to the side rails. I am trying to avoid having to buy more wood for the slats! Our bed has space around the mattress that would lead me to think having the metal frame inside would work, however, with the chance of differing mattress sizes, I would measure to be sure! Hi there! Absolutely love your bed! 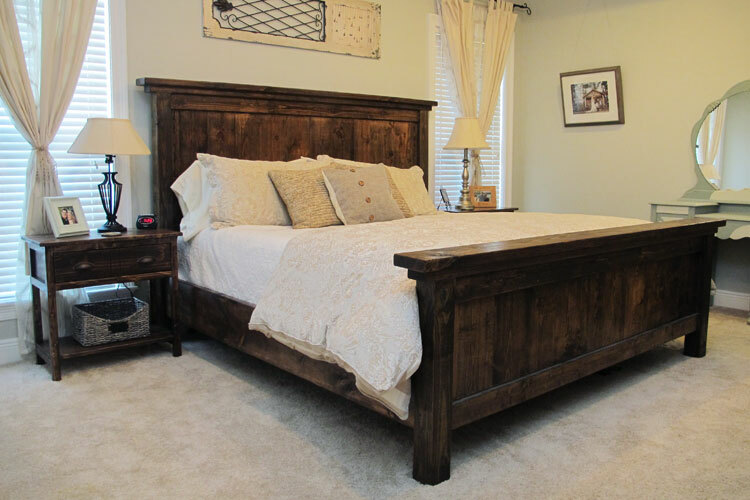 One question–what size are the two top pieces on both the headboard and footboard? The very top piece looks like a 2×4 but I can’t tell for sure from the picture. Thanks! How did you attach the 4×4 posts? We followed the instructions available in the post and also on ana-white.com. Did you also make your nightstands? If so do you have the plans.